Integrative Wealth Management : Sauser Financial, LLC - Integrated Strategies. Comprehensive Solutions. We are different because we take the planning process beyond the numbers to focus on our clients' unique vision, values and objectives. There are a myriad of things that keep them up at night; things like a desire for lifetime economic security, asset protection, transferring their core values to the next generation and more. 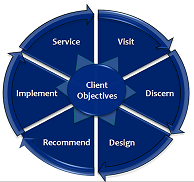 Our consultative approach is comprised of six steps designed to collect information relevant to your financial situation, crystallize your important objectives, uncover gaps affecting these objectives, and design and implement creative strategies to help you reach your financial goals; and help ensure you have created the legacy you envisioned. This is where we visit and listen to your story. Through thoughtful questions and active listening, we gather all the hard and soft facts from your current personal, business and estate plans. We then take these facts and produce a clear, understandable picture of your current situation. People generally have three kinds of plans: the plan they want, the plan they think they have, and the plan they actually have. Once we have analyzed your current situation, we review it with you exactly as it is in that moment. Nearly 100% of the time, our clients discover their current plan does not reflect their true intentions. To ensure your plan is the one you want, we continue to further discern your intentions as they relate to your financial planning and investment management objectives. With your objectives as the benchmark, we design and recommend creative strategies built specifically to fulfill your desired objectives and ultimately achieve the legacy you want. In the previous steps, we have discovered what is needed to overcome the obstacles preventing you from achieving your objectives. We are now ready to work alongside you to implement your strategies. In addition, we will coordinate the implementation of these strategies with your tax and legal advisors. We desire to not only bring added value to you and your future, but to be indispensable to you as well. We are committed to providing you with ongoing service in an effort to make sure the plan you have is always the plan you want. Our Integrative Wealth Organizer helps keep your plan on track with your evolving needs, goals and desires. In an ever changing tax and regulatory environment, this is a particularly important part of our process.